Adam Scott drives off the 15th tee box during the first round of the Arnold Palmer Invitational. 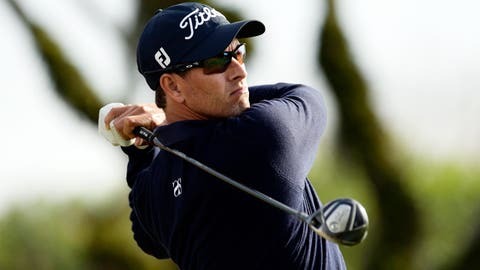 ORLANDO, Fla. — Masters champion Adam Scott was feeling ill when he arrived at Bay Hill. One majestic round with the putter Thursday made him feel a lot better. Scott made five putts from about 20 feet or longer, two of them for eagle and one of them from off the green for birdie, and matched the course record with a 10-under-par 62 to build a three-shot lead in the Arnold Palmer Invitational. The conditions were close to perfect. So was his work on the greens. "I made a lot of putts today, and a lot of putts from considerable length," Scott said. "I hit a lot of nice shots, too, but it wasn’t like I was hitting it 4 feet. I had a round like this in Australia at the end of last year — in the first six holes, I didn’t hit it outside 5 feet. There’s a lot of different ways to get the ball in the hole. But it’s good for the confidence. It’s what I wanted. I sat in here yesterday and said I’d like to make some birdies and build the confidence. And today is a good start to that." Ryo Ishikawa, who uses Bay Hill as his home course on the East Coast, birdied the 18th for a 65. John Merrick celebrated his 32nd birthday by reaching 8 under until a late bogey. He also shot 65. Both were 10 shots behind before they hit their first shot of the tournament. "That took the pressure off," Merrick said. "You’re already 10 shots behind, so it’s not like you’re protecting anything. But this isn’t the Bay Hill I remember. I don’t usually play golf in Florida without 20-mph wind." Gonzalo Fernandez-Castano had his best round of the year with a 66. Brandt Snedeker and Paul Casey were among those at 67. They were all but forgotten with Scott’s 62 on the board. Scott walked from the ninth green across the practice range to the scoring trailer as one player after another turned his head and asked how low Scott went on the day. One caddie quipped, "Is there a 10-shot rule when you haven’t teed off?" It was the lowest round in 30 years at Bay Hill, and it was good enough to make a large gallery following Scott forget for a moment that defending champion Tiger Woods is not here this week because of a back injury. Andy Bean in 1981 and Greg Norman in 1984 are the only other players with a 62 at Bay Hill. After watching Scott make another putt — this one from 20 feet for eagle on No. 4 — U.S. Open champion Justin Rose asked if Scott could get to No. 1 if he were to win at Bay Hill. The answer: no and yes. He couldn’t overtake Woods this week, but likely would go to No. 1 over the next few weeks if neither played. Scott had reason to be mildly surprised by this round. For one thing, he had not been to Bay Hill in five years. Scott typically plays Innisbrook, but decided to mix it up. And he does have some experience on the bag. His caddie is Steve Williams, who worked for Woods in six of the eight Bay Hill wins. Even more surprising, though, is that Scott said he was coping with flu-like symptoms, and still doesn’t feel completely healthy. "It’s hard to say that I’m sick," Scott said with a smile. "I feel actually better now than when I woke up. Just a bit under the weather. I can’t complain." Scott is a believer in the adage, "Beware the injured golfer." He lowered his expectations, concerned himself only with the next shot and was more concerned with his energy than feeling any nerves. It didn’t take long for him to realize it was going to be a special day, starting with a 20-foot birdie putt on the 10th to start his round. He got up and down from a bunker on the par-5 12th for birdie, made a 25-foot birdie putt on the 14th, and then rolled one in from 30 feet on the 15th from a collection area right of the green. Scott drilled a 7-iron into 35 feet on the par-5 16th and made that birdie. On the front nine, he hit a pure 3-wood into 20 feet on the par-5 fourth for birdie, and then hit a tough bunker from some 35 yards away to 8 feet for birdie on the par-5 sixth. It was the sixth time Scott has had a 62 on the PGA Tour, the most recent in 2011 at Firestone the year he won. But he didn’t want to look at it as anything more than just a great start, especially with half of the field still to play in the afternoon. "Hopefully, with a solid round tomorrow I keep myself right in this golf tournament," he said. "Like at any event, you want to start and put yourself right in it from the get-go and I’ve done that here." DIVOTS: Bubba Watson hit three tee shot into the water on the par-5 sixth and made an 11. He shot 83 and withdrew. . . . Snedeker had not broken 70 in the first round all year until Thursday. . . . Pat Perez opened with a 70, ending his streak of nine straight tournaments in which he shot in the 60s the first round.